My Run: Overall, the Mercedes Marathon was my eighth full marathon, and third in the last 90 days (Rock n’ Roll San Antonio on 11/14, WDW Marathon on 01/09). Coming into this race, I had been trying to temper my expectations because of my heavy race schedule this winter, and due to missing significant training time from a series of illnesses (influenza, sinusitis, lung inflammation, stomach virus). I had set my PR of 3:24 at the Rock n’ Roll San Antonio, and then basically ran the WDW Marathon with the flu, and finished in 3:43. 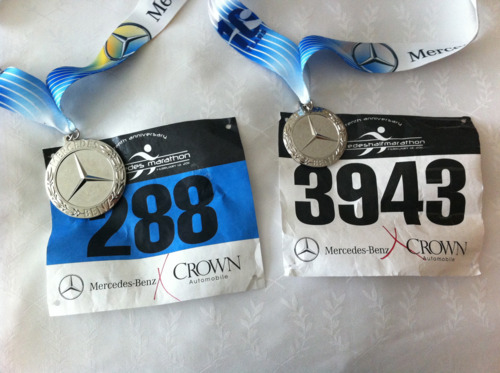 For the Mercedes, I was hoping for just under 3:30, and really didn’t want to push it any harder. Looking back now, I think that was a reasonable goal, but for some reason when the gun went off I began running way faster than a 3:30 pace. Something inside of me took over (probably my ego), and I began thinking about setting another PR. I honestly knew very little about the course when the race began. I knew it was a double-loop and that there were some hills between miles six and ten. From the elevation chart, it looked like the total elevation gain through the hills would only be 100 feet or so, which would not be too significant. Also, the weather was spot-on perfect. Sunny and mid 30s at the start, with temps rising near 50 by the finish. To my suddenly fired up mind, this seemed like a perfect opportunity to set another PR. 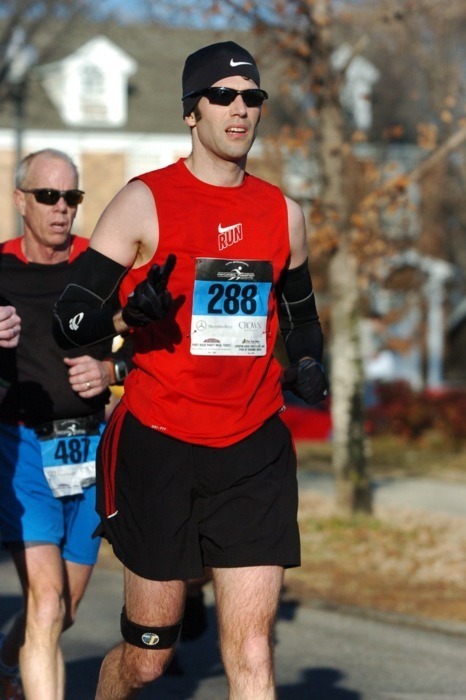 However, one really puzzling thing about my sudden shift in mindset was that I never felt comfortable during the race. Even though I was running strong at the start, I never felt a good steady rhythm. It felt like I was fighting the course every step of the way. I had hoped this would subside after the first few miles, but it never changed. 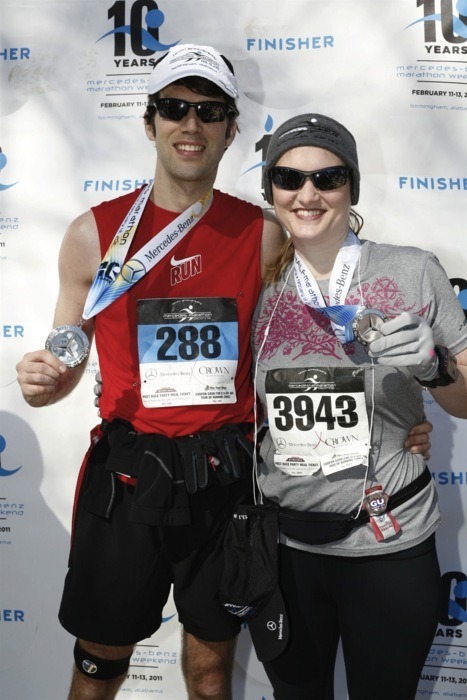 After splitting off from the half-marathon course during mile 12, I began to feel very isolated. There were over 7,000 participants on the course before the split, and less than 1,200 after. This combined with the fact that there was virtually no crowd support completely changed the feel of the course. The double-loop course felt very daunting after the half-way point. Not only was I discouraged about having to run the same course again, but I also began thinking about how hard the hills were during miles six through ten, and that now I would be running them again during miles 19 through 23. My legs were already beginning to betray me. I definitely underestimated how much of a toll the race schedule and missing time due to illness had taken on my body. Even with these factors, I was still able to maintain pace through mile 18 before the fatigue in my legs began to take over. When I reached the hills at mile 19, I knew that I was in trouble. I did not technically “bonk,” because my heart rate was still in great shape. However, my legs were completely shredded. I could either take the pace way down or risk not being able to finish. For the remainder of the race, my pace fluctuated between 8:30 and 9:30. I even stopped twice to walk during the more significant hills. My thoughts of a PR turned back to 3:30, and then 3:35, and finally sub 3:40. I was able to pick it up slightly during the last mile to come in just under 3:40 at 3:39:46. This meant that my second half was around 17 minutes slower that the first half. Right after the finish, I was fairly pleased with the race and simply chalked up the slower time to what I still consider to be the toughest of the 8 marathon courses I’ve run. However, after a few days to reflect on the race I have begun to feel more and more disappointed. My disappointment is not really about the finishing time, but more about my failure to follow the strategy and goal I had set out before the race. The same thing happened to me at the Country Music Marathon last year and my second half time was 21 minutes slower than the first. There is definitely a lesson to be learned here. I know it must sound like I had a miserable time, but the great thing about running marathons is that even with everything I’ve mentioned above, I still had fun! Completing a marathon is still one of the most satisfying experiences I’ve ever felt, even when things don’t go according to plan. I can’t wait to do my next one. 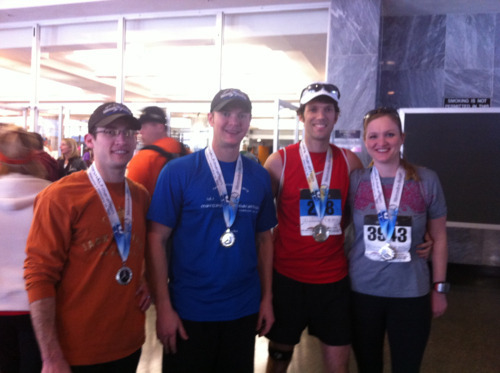 Friends and Family: It was great to be able to share the events of the weekend with my wife Olivia and dear friends Nathan Wright and Paxton Baker, all of whom were competing in the half marathon. For Olivia, this was her sixth half marathon, and third in the last 90 days (Rock n’ Roll San Antonio on 11/14, WDW Half Marathon on 01/08). Olivia had also missed some time recently due to illness, but was able to set another new PR of 2:44. That was three minutes faster than her previous PR set in San Antonio. Nathan and Paxton also set new half marathon PRs by completing the race in 1:36, an incredible time on a difficult course. We were also joined by our friends Edward Russell and John Thorpe from the Jim Spivey Running Club (JSRC). Ed completed the half marathon in 1:41. He passed me during mile 11 of the course, and finished really strong. John completed the marathon in 3:04, finishing in sixth place within his age group (btw…same age group as me, but I was 26th). 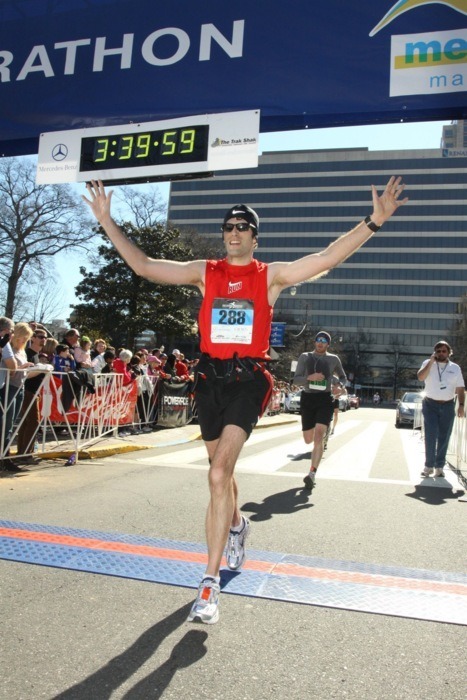 The Race: Overall, I would give that race organizers a solid “A-” – This race has the potential to be a premier event with just a few minor additions and tweaks. The police and volunteer support was as good as I’ve seen at any race. Even though I’m not a huge face of the “double-loop” course concept, I’ll have to say that the course is well laid out, and stunningly beautiful in many places. All full marathon participants received an long sleeved, gender-specific technical t-shirt (half marathon participants get a short sleeved shirt). The finisher’s medal has got to be one of the best in any race in the country. It is a large, silver replica of a Mercedes hood ornament (AWESOME!). All full and half marathon finishers receive a finisher’s hat. There were 22 aid stations, and all had water and PowerAde. The water and PowerAde were both in the same PowerAde cups, and not all aid stations were organized in the same way. However, the volunteers did a great job of letting the runners know how the stations were organized. All of the mile-markers were elevated, and had split times. For some reason, the first mile-marker was missing, and some of the split-time clocks were not functioning. The starting area was not divided into corrals, and there was significant congestion with runners jammed in near the front of the starting area. I’m glad that they don’t have a wave start, but it would be nice to see assigned corrals to better space out the runners in the starting area. The finish was well laid out, and it was a nice touch to announce everyone’s name as the crossed the finish line. The PA announcer even yelled to me “Hey guy in the red, if you pick it up you can beat 3:40!” There was water and PowerAde immediately at the finish, along with several types of fruit and snacks. There was also plenty of room to move around and stretch out. The post-race party was also very nice, with food catered by Jim-n-Nick’s BBQ. The bag check location was clearly marked at the race start and finish. The race had several pace groups, but there were no groups under 3:45 finish times. The race has very limited crowd support except for a few pockets at the start, Five Points, and at the finish. The fact that the weekend includes a kid’s race, a half marathon, a marathon relay, and a 5k, makes it a great event for the whole family. 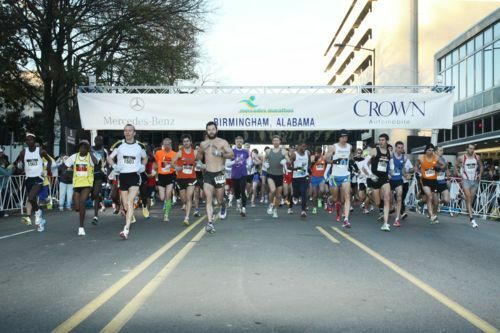 The Course: The course starts off in downtown Birminham on eighth avenue, and winds it’s way on a southern loop through the Five Points area before making it’s way back downtown. The downtown area is a mix of flat stretches and rolling hills. The Five Points area is much more hilly, but is also stunningly beautiful. As I’ve mentioned earlier, this is a difficult course. By my Garmin, there was just under 1,000 feet of elevation gain throughout the course. The hills during miles six through ten, and 19 through 23 are tough. At least two of them cover the better portion of a mile, and are followed by very short downhills before reaching the next hill again. I wish there was a way to design a marathon course for the Mercedes that did not require a double-loop, but it is my understanding that the original design utilized during the first few years of the race was MUCH more difficult than the current iteration, and that the double-loop is the only reasonable way to make it a fair course. From a race-organizer’s perspective, I can clearly see the advantage of a double-loop course; fewer aid stations, fewer volunteers, fewer road closures, etc.